The fact that the New Testament authors often referred or alluded to, or quoted from their Scriptures (roughly what is known today as 'the OT'), and then very often linked those quotations, references, and allusions from their Jewish Scriptures to the Christ-event, has led to the viewpoint of some that 'Christ is found in the OT' - that is, that the OT prophesised about the events that took place regarding the person, Jesus of Nazareth. It is the intention of this contribution to confirm the position of mainstream biblical scholarship that the Old Testament does not predict the events surrounding Jesus of Nazareth, but that the New Testament writers interpreted the Jesus-events in hindsight in the light of the Scriptures of Israel. The current study attempts to firstly unfold the meta-narrative of the New Testament in five acts. Against the backdrop of the last of these acts, the case of the crucifixion of Jesus as interpreted by Paul to the early Christians in Galatia receives particular attention. It is argued that Paul's presentation of the crucifixion in Galatians - as based on Deuteronomy 21:23 - is done retrodictively to portray Yehoshua ben Yoseph as liberator of the law in Asia Minor. This study proposes the coinage of a new term in canonical biblical scholarship, namely the term 'retrodiction' - in opposition to the term 'prediction'. One of the major debates in biblical scholarship over the last number of years has been the issue relating to matters surrounding the canon of the Bible. Whether this involves studies on the Dead Sea Scrolls (DSS), the Pseudepigrapha, or Old Testament (OT) and/or New Testament (NT) scholarship, the issue of canonicity constantly surfaces - this despite the fact that the term itself was not in existence during the 1st century of early Christianity, but was only introduced during the later history of the church. Alongside the debate on the authority that certain ancient documents had for the communities in which they were used, and their place amongst other ancient documents within particular collections, runs a similar debate in modern and post-modern Christian circles - especially in Protestant circles. This debate centres on the relation between the OT and the NT in the light of the Christ-event. The fact that the NT authors often referred or alluded to, or quoted from their Scriptures (roughly what is known today as 'the OT'), and then very often linked those references, allusions, and quotations from their Jewish Scriptures to the Christ-event, has led to the viewpoint of some that 'Christ is found in the OT', that is, that the OT prophesised about the events that took place regarding the person, Jesus of Nazareth. Augustine was one of the first who stated: 'in vetere novum lateat, et in novo vetus pateat (Quaest. Hept. 2.73; PL 34.625). Some NT scholars later even operated with a 'prophecy-fulfilment' paradigm.1 A.T. Hanson is a typical example of this approach with his 1965 publication on Jesus Christ in the Old Testament.2Most OT scholars would, in general, strongly resist this way of thinking and would point to the contexts, origin, and the destination of each OT document. But even amongst them are some exceptions. In 1964, the South African OT scholar A.H. van Zyl (1964) wrote a booklet entitled: Kyk, Hy kom! Heenwysings na die Christus in die Ou Testament ('Behold, He is coming! Pointers to the Christ in the OT'); the words 'He' and 'Christ' in this title are printed with capital letters. The phenomenon continues into recent times. For example, in an Afrikaans Bible translation produced for popular usage, the Bybel in Praktyk ('Bible in Praxis'), a list is provided labelled: 'Christ in the Psalms'. Added to all this, in the case of the recent translation process of the official new Afrikaans Bible translation by the Bible Society of South Africa, there has again been strong pressure from some groups and individuals to use capital letters at a number of places in the OT, as it is argued that those passages refer directly to Jesus. Many of these OT texts at issue are better known in such Christian circles as so-called 'messianic texts'. Modern day Christianity thus continues to be confronted with the question: Should we understand the events surrounding Jesus of Nazareth from the OT onwards towards the NT (in other words, is the OT thus a 'prediction' of Jesus Christ); or should we rather understand the events surrounding Jesus of Nazareth through the NT - with the NT's own interpretation of the OT (in other words, is the NT 'a reflection on the OT in the light of Christ')? It is the intention of this contribution to confirm the position of mainstream biblical scholarship that the latter position should be preferred, namely, that the OT does not predict the events surrounding Jesus of Nazareth, but that the NT writers interpreted the Jesus-events in hindsight in the light of the Scriptures of Israel. Given the plea by some to print certain nouns and pronouns in capital letters in the translated OT text, in order to indicate their nature as texts predicting the Jesusevent, it is yet again confirmed that Bible translation in itself remains interpretation - in the same manner as the reading and exposition of the Bible by its readers and exegetes are interpretations and just as Paul and the other early Christians read their Scriptures in their day in an interpretative manner. It is impossible for most Christians today to approach their Bible translations in a purely objective manner. It is for them a religious book with a long dogmatic history that is intertwined with the history of the Christian church. For some it contains the revelation of God or the Word of God, whilst for others it is the revelation of God and the Word of God. It is, for most Christians, not a collection of ancient documents that developed over a period of more than a 1000 years, and is therefore not considered by them to be 'Biblia' in the plural (a library), but rather a 'Biblos' in the singular; that is, they consider it to be a single book. Critical biblical scholarship on the text and canon of the Bible also differs, to some extent, in the eastern and western branches of Christianity. Whilst it is hardly present in eastern Orthodox Christianity, western Catholic and Protestant Christianity, on the other hand, have long established traditions of critical biblical scholarship - at least in some of these circles. The current study intends to unfold the meta-narrative of the NT in five acts. The last of these acts hems in on Paul's interpretation of the crucifixion of Jesus through his Scriptures3 - as based on Deuteronomy 21:23 in his Letter to the Galatians. It will be argued that Paul's presentation of the crucifixion in Galatians is done retrodictively to portray Yehoshua ben Yoseph as liberator of the law in Asia Minor. Paul is chosen here intentionally, as he represents the earliest stratum of Christianity and because his use and interpretation of the Scriptures, as well as his pictures of Jesus (Christology), form a multi-coloured tapestry that has been extensively investigated in biblical scholarship during the last few centuries. The Scriptures of Israel formed a compendium of the understanding of religious Jews about their relation to their Jewish deity, Yahweh, over many centuries. It consisted of law books, history books, prophetic books, and collections of proverbs, hymns, and psalms. These different kinds of books were collected over a period of time and transmitted onto scrolls during the time of the Second Temple Period, of which copies were circulated amongst the Jewish communities in the Diaspora. Several Jewish communities in Egypt, Asia Minor, Greece, and Rome thus had access to one or more of these scrolls (such as e.g. the Torah Scroll, Scroll of the Minor Prophets, Scrolls of Isaiah and Jeremiah, the Scroll of the Psalms, and so forth). The Scriptures of Israel were also read, studied, and used during cultic events in the history of the Jews. It contained instructions for a lifestyle that was expected to be in accordance with their religious understanding of the identity of Yahweh, and this Deity's involvement in their history as the 'people of God'. Over a long period of time they had built their future eschatological hope on a figure that would arise from their midst and hold an authoritative anointed (messianic) position. The expectation was largely that it would be someone who would be able to liberate them from their long periods of oppression under the Babylonians, the Persians, the Greeks, and the Romans. There were different expectations and profiles of this figure during the course of history, as documented by a variety of writers over the centuries. Such a messianic (anointed) figure could have been a king, a prophet, a high priest - or even a combination of these. Hence, according to some, this figure might be a royal figure, similar to king David, and he would be a descendant of him. Kings were considered as 'sons of gods', especially in the Egyptian and Roman empires. According to other ancient writers, however, this figure would be someone like the prophets Moses and Elijah. Others, yet again, expected someone 'like the son of man' -an apocalyptic figure described in the vision of Daniel 7. Whereas the royal and prophetic expectations were largely expectations of an earthly human being, the expectation of an apocalyptic figure took a more transcendent shape. These expectations have set the tone for any and all future hope of liberation and salvation. A Jewish boy was born in Bethlehem (Mt 2:1, 5; Lk 2:4) -probably during the reign of Ceasar Augustus (27 BCE-14 CE). He eventually grew up in the town of Nazareth in the northern province of Galilee (Mt 2:22-23; Lk 2:39-40). He carried the Hebrew name Yehoshua (Mt 1:21, 25; Lk 1:31), and being the son of the carpenter Yoseph (Mk 6:3; Mt 1:19-20; Lk 2:4), he was most likely commonly known in the village of Nazareth as Yehoshua ben Yoseph, or amongst the Greek speaking members of the society, as Iēsous. This Jesus of Nazareth came in contact with the religious movement of John the Baptist, who preached that someone greater than he will come, that the salvation of God from sin has arrived, that people should be converted and be baptised (Mk 1:4; Mt 3:2; Lk 3:3). Jesus let himself be baptised by John (Mk 1:9; Mt 3:13; Lk 3:21), then called a number of ordinary people to follow him as his disciples (Mk 1:16-20; 2:13-17; 3:13-19; Mt 4:18-22; 8:18-22; 9:9-13; Lk 5:1-11, 27-32; and 6:12-16) and started to preach. But his ministry developed to another level when he also started healing people, and even performing exorcisms. Interacting with ordinary people, with the marginalised of the society, addressing their basic needs, and preaching to them about a future hope, led to a gradually increasing number of followers. He became known and famous in the surrounding areas. Furthermore, being critically outspoken against the religious establishment of his day, and particularly against the Pharisees, Sadducees, and Scribes, soon led to friction and plots to get rid of him. Eventually, being betrayed by Judas Iscariot, one of his own group, and at the instigation of the religious leaders of his own people, he was executed by means of Roman crucifixion. The content of the message proclaimed by Jesus of Nazareth was largely eschatological in nature. This became clear, amongst other places, in his Sermon from the Boat (Mk 4:1-34), from the Mount (Mt 5-7) or the Plain (Lk 6:17-49), his Sermon in the Synagogue in Nazareth (Lk 4:16-30), and his prophetic speeches (Mk 13; Mt 23:37-25:46; Lk 21:538). His preaching carried the message of hope and future restoration. He indicated that the expectation of restoration and salvation had finally arrived through his own arrival and ministry. The expectation of the Jews over many centuries was that of a political or military leader who would liberate them. So, when Jesus arrived from Galilee, the province of his home town in the north, and when he entered the city of Jerusalem in the southern province of Judea on a donkey, the Jews assumed that this was the moment of their liberation and they sang a praise song and honoured him by waving palm branches and throwing their clothes in the road in front of him. But it was not political salvation that Jesus of Nazareth intended to bring. His ministry had a religious, not a political, tone; he focused on a restored relationship with God. He was a holy man or prophet figure rather than a political liberator. This was in line with the preaching of John the Baptist. Future restoration would start with the relationship that people had with God, and it would be a restoration of the broken covenantal relationship between God and his people. Later writers would, in retrospect, refer to this as a 'new covenant'. A great deal of Jesus' teaching thus centred on the hypocrisy of the religious establishment of his day with its empty and ritualistic following of the Jewish Law. What was required, according to his message, was rather an honest recognition and admission of a sinful relationship with God from which people needed to be converted. This would imply a theological-ethical change in lifestyle. Matthew emphasised in this regard the importance of a change in attitude when it comes to the Law. Luke, on the other hand, emphasised the importance of engagement with the socially marginalised. But, as time went on, the masses became disappointed and impatient with the fact that nothing changed on the political front, and the religious leaders became itchy and angry about Jesus' criticism. After a brief performance period of 3 years, the Jew of Nazareth, Yehoshua ben Yoseph, was executed. But his memory lived on, and so did his message of hope and future restoration. What he said (logia) and what he did (acts) were told to the younger generation and to those who were still unfamiliar with the life-story of Jesus of Nazareth. There is, however, another side to the story - a more controversial side - with regard to the transmission of his identity: who he was, what he had said and done, and particularly, what happened to him after his execution. There were stories that the tomb was mysteriously empty after his burial; that he was raised from death; that he appeared to some of those who knew him; and even that he ascended to heaven.4 It is this side of the story that often divides both biblical scholars and Christian believers. The question now became: Was Yehoshua ben Yoseph, Jesus of Nazareth, indeed the Jewish Messiah in one or more of the profiles in which he was expected to appear? This was the question that the four gospel writers intended to answer during the last 40 years of the 1st century CE. But, about a decade earlier than these attempts, some letters circulated between the Pharisee, Saul of Tarsus, and the earliest Christians in Asia-Minor, Greece, and Italy. According to Luke's description in Acts, Saul's experience of this Theophany, or rather Christophany, on his way to Damascus, changed his life. Similar to other prophets in the past, Saul thus had a vision - but this time it was not God, but Jesus who appeared to him. This event made Saul believe that Yehoshua ben Yoseph was not just the Jew from Nazareth, but that he was the resurrected Christ (1 Cor 15). This event changed Saul from being a persecutor of Jesus-followers to Paul, a devoted Christian missionary (Gl 1:1516). He now travels the ancient world to share this message, to establish and visit the earliest Christian congregations, and he writes letters to several of them. His message is quite simple: It is the 'good news' (gospel) that Jesus of Nazareth, Yehoshua ben Yoseph, was the long expected Jewish Messiah (Christ). In his letter to the Philippians in Greece, he explains how this Messiah, who has the nature of God, humbled himself by becoming human and taking on the nature of a servant (Phlp 2:5-11). This human, Jesus, was God's obedient son who died a vicarious death for all in order to facilitate God's remission of sin. According to Paul's correspondence, the history of the Jewish people is now extended to include the non-Jews as well - going as far back as the common ancestors of all humanity, namely, Abraham, and even Adam himself. Hence, the Jewish salvation history now makes provision for the salvation of all who accept this good news (Rm 2:28) and who believe (1 Cor 1:21) that Yehoshua ben Yoseph was the mediator who brought reconciliation between God and humanity (Rm 1:3) through his death by crucifixion (1 Cor 1:18). It is 'through Christ' that people are now reconciled with God, not by anything that they could do, but by God's grace - who accepted the executionary death on the Roman cross of Yehoshua ben Yoseph, the Christ, as a 'sacrifice' (cf. Gl 3:13) for the forgiveness of sins and justification by God (Rm 1:17). By accepting this message, believers are spiritually recreated and now live forever with God's Spirit dwelling in them (Rm 8). All this puts the Mosaic Law into a whole new perspective (Gl) so that believers are now 'free in Christ', and requirements, such as circumcision, or abstinence from the eating of meat sacrificed to pagan gods, become obsolete. Paul passionately emphasises the urgency to accept this message (1 Th) - including the ethical implications of it once it has been accepted (1 and 2 Cor), such as the relations between man and woman (1 Cor 7), owners and slaves (Phlm), parents and children, Christian love (1 Cor 13), Christian joy (Phlp 4:4), Christian hope (1 Cor 13) and perseverance (Phlp). The following case will now serve as an example to illustrate how Paul quotes from and alludes to his Scriptures in order to scripturally substantiate the death of Yehoshua ben Yoseph by means of crucifixion. Paul wrote his letter to the Galatians either between 50-52 CE during his stay in Corinth (if the southern Galatian theory is accepted), or during 52-55 CE from Ephesus (if the northern Galatian theory is accepted) (cf. Du Toit 1984:35; Kümmel 1975:304; Schnelle 1996:118) - the more generally accepted theory. He quotes explicitly from six texts within the short space of Galatians 3:1-14, of which five are from the Torah (Gn 15:6; 12:3; Dt 27:26; Lv 18:5; and Dt 21:23) and one from the prophet Habakkuk (2:4).8 The quotation from Deuteronomy 21:23 in Galatians 3:13 is the last of the six in the list (Table 1). The regulation of Deuteronomy 21:22-23 about the body of someone who had been executed is situated within the religious and social laws of Deuteronomy 12-28. The instruction requires that the body be removed 'from the tree' the same day before night falls. Scholars concluded that this hanging meant the public display of the corpse of a criminal by impalement on a post, exposing the body after the execution itself (cf. 1 Sm 31:10). The intention was then 'to heap shame on the victim after his death'. This would imply that such a person broke the covenant and was under God's curse (Carson 1994). Both the Hebrew and the Greek versions of Deuteronomy 21:23 utilise a subjective genitive, indicating that such a person is 'ein von Gott Verfluchter' - contrary to the objective genitive of the later rabbinic traditions (Billerbeck 1969:544). The association of Deuteronomy 21:22-23 with crucifixion rather than with post-mortem impalement may be seen in the evidence from the Dead Sea Scrolls (Lincicum 2010:146), which indicates that crucifixion was probably also practised by Judaism and not only by the Romans (Green, McKnight & Marshall 1992:854; Hagner 2002:824). The Temple Scroll, for instance, reads: 'You shall hang him on the wood so that he dies' (11QT 64.8, 10-11; see also 4QpNah 3-4.1.7-8). This practice by the Jews is also referred to by Philo of Alexandria (25 BCE-50 CE) (Spec. 3.152; Post. 61; Somn. 2.213). 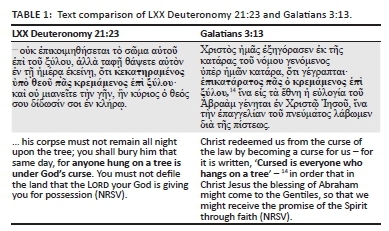 The rationale of the instruction in Deuteronomy 21:23 is that someone who is hung on a tree is cursed by God and the elevated corpse will desecrate the land of inheritance. It was believed that the spirits of people who were not buried would not enjoy repose in the after-life, so this law reduced the risk of probable defilement of the whole people, following 'the ancient conception that the land must be protected against ritual pollution' (Von Rad 1966:138). This practice of burying the corpses of the crucified is also attested to later during the 1st century CE by Josephus (J.W. 4.5.2 §317). The crucifixion of Yehoshua ben Yoseph was problematic within the theological framework of early Christianity. It communicated the policy of no tolerance by the Roman Empire against anyone who had not complied with their laws - be it due to criminal offences or to political resistance. The tragic end of a messiah, who was expected to liberate his people and to triumph over foreign rulership, would have been difficult to explain to outsiders by those who were devoted followers of this movement. Studies by Lindars(1961:233) and Kim (1982) have argued, therefore, that Paul used Deuteronomy 21:23 as a polemic reaction to his enemies, who were already quoting this text.9 Others, however, think that this text had its origin in an early Christian Testimonia collection, as 'part of an early Jewish-Christian midrashic exposition of the Akedah' that made a typological link between Isaac and Jesus (Wilcox 1977:86, 99). But a more acceptable reason for the selection of this passage still remains the one held by mainstream scholarship, namely, that Paul uses the Jewish exegetical method of gezerah shewah: verbal analogy is used with the same words being applied to two separate cases (Caneday 1989:187). With or without any connection to a possible debate about the negative perception of the crucifixion, Paul links the law about those who hang 'upon a tree' with the event of the crucifixion of Jesus of Nazareth. More difficult than deciding between the northern- and southern Galatian theories is the identification of any possible connections with the role of the Attis-cult, which had its origins in Hellenistic Asia-Minor with Cybele, as magna mater (Klauck 1995:106-111), or even earlier in Greece during the 4th century BCE.10 It is virtually impossible to determine responsibly whether knowledge of this cult by Paul might have played a role in his selection of the 'tree text' of Deuteronomy 21:23. The role of the cross during the passion of Christ, on the one hand, and the annual Attis-festivities between 22 and 25 March as practised in Rome during the middle of the 1st century CE, on the other hand, is nonetheless striking in some aspects with its polarity between 'Trauer und Freude' and 'Tod und Leben' (Table 2). Deuteronomy 21:2312 in Post. 26. Both the LXX and Philo have the perfect participle (the LXX in the nominative, Philo in the accusative) + υπόθεου, whereas Galatians 3:1313uses the adjective έπικατάρατος and lacks υπόθεου. There are two possibilities here. Galatians might have omitted υπόθεου due to theological reasons in order not to put the emphasis on God's cursing, but rather on the fact of being cursed when you hang on a cross. Alternatively, its absence in Galatians might represent another textual tradition that steered away from the use of God's name - as it is already implied with the use of the perfect participle. However, in the latter part of the quotation, the LXX and Galatians are closer when both use πας + praesens participle nominative (Gl 3:13 with the masculine article)14 - whereas Philo lacks πας and follows the praesens participle accusative with the article. But Philo's use of this text should be classified, in this case, as a paraphrase rather than an explicit quotation. A case for this might be made from (1) the way in which the quoted words are introduced, lacking an expected δτι, (2) the consistent use of the accusative, and (3) from the position of φησίν, which appears only after the quoted words. If this is true, then Philo is probably closer to the original LXX text form in the first part of the quotation, but Galatians in the second part. It is clear that the context of the passage in Deuteronomy carries an exclusively negative connotation regarding God's curse, which is attached to the one who is crucified. But there is no reference whatsoever, neither implicit nor explicit, to the crucifixion of a messiah or to Jesus as crucified Christ in the legal code of Deuteronomy 21:22-23.16 Watson (2004: 420-421) confirms that the scriptural text functions as a valid piece of legislation, and not as a prophecy of Christ'.17The hermeneutical link with the death of Yehoshua ben Yoseph by crucifixion is only made in the NT by Paul himself, who reinterprets the passage in the light of the Christ event when 'Paul found a unique connection between curse and crucifixion' (Lincicum 2010:146). Ciampa (2007:103) is correct in pointing out that 'Paul does not say the verse refers to Christ, however, but indicates that we can learn from it how Christ's death might provide a means of redemption from a curse'. This passage in Deuteronomy 21:23 - one of the oldest in the written Christian tradition - clearly is no prediction of Jesus' death, but rather a Pauline interpretation in the light of Jesus' crucifixion by means of 'retrodiction'. Hence, in the light of the absence of OT predictions about Jesus, this study would like to propose the coinage of a new term in canonical biblical scholarship, namely the term 'retrodiction' -in opposition to 'prediction'. The term 'retrodiction' is not a neologism, but an existing terminus technicus which is already in use in several other scientific disciplines. M.C. Price uses it in its scientific context in the sense that '[a] retrodiction occurs when already gathered data is accounted for by a later theoretical advance in a more convincing fashion'.18 The term can simply be defined as 'using present information to make an assertion about the past19', or to 'explain a past event or the state of affairs in the light of present information'.20 This is precisely what the early Christian writers, such as Paul of Tarsus, did with their Scriptures. This article is a shortened and reworked version of the author's inaugural lecture as Head of the Department of New Testament Studies delivered on 27 August 2012 at the University of Pretoria. 2 However, there seemed to have been a shift in Hanson's (1980) thinking when, 15 years later, he presented a study entitled The New Testament interpretation of Scripture. 3 For Paul as a witness to the historical Jesus, see the recent study of Müller (2012:117-130). 4 According to Wellhausen and Bultmann, the historical figure, Yehoshua ben Yoseph, Jesus of Nazareth, was not a Christian 'because being a Christian implies confessing faith in Jesus as resurrected Lord' (Müller 2012:119). 5 This personal encounter with Christ determined the whole course of Paul's subsequent thought and actions (Hawthorne, Martin & Reid 1993:682). Ellis (1981:38-39) argues that this event had a direct impact on Paul's understanding of Scripture. 6 See the studies of P. Nagel (2012), 'The explicit Kurios and Theos citations by Paul: An attempt at understanding Paul's Deity concepts', PhD thesis, University of Pretoria, Pretoria, and D.B. Capes (1990), 'Paul's use of Old Testament Yahweh-texts and its implications for his Christology', PhD thesis, Southwestern Baptist Theological Seminary, Fort Worth. 8 See Wakefield (2003) for a discussion on the hermeneutical significance of these quotations in Galatians 3:1-14. 9 Longenecker (1994:385) takes a similar approach when referring to 'Paul's catena of polemically motivated passages in Gal. 3:10-13'. 10 ' There we find depictions of the Mother with an accompanying male god who is identified as Attis' (Bowden 2010:102). 11 Wakefield (2003:58) aptly formulated this phrase. 12 Maier (2004:278) disagrees with the view of Yadin and most commentaries who assume that 11Q19 [hat] das Verbot Lev 19,16 in eine erweiterung von Dt 21,22.23 eingebaut'. 13 Ellis (1981:150, 152) classifies the quotation in Galatians 3:13 as one that is 'at variance with the LXX and the Hebrew where they vary'. 14 The inclusion of the article in some of the LXX witnesses is probably the result of later influence from the NT text tradition (Koch 1986:54). 15 'Paul seeks to ground in Scripture his assertion that the Galatian Gentile believers received the Spirit through the hearing of faith and not by law observance (3:2)' (Lincicum 2010:143). 17 'What [Paul] can do is to reflect on the scriptural connection between public execution and the divine curse, and to ask what light that connection sheds on the redemption Christ has achieved' (Watson 2004:420-421).